The leader of the new Space Development Agency (SDA) unveiled a national future space architecture that the agency plans to develop over the next few years during his first public appearance as SDA director at the Space Foundation's 35th annual Space Symposium on April 9. 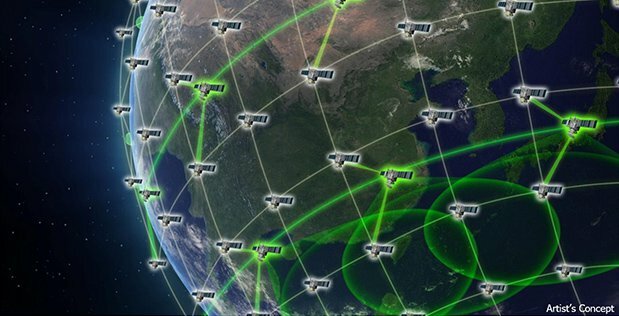 Fred Kennedy, who previously led the Defense Advanced Research Projects Agency's (DARPA) Tactical Technology Office, said the main priority of the SDA is to build a proliferated communications and transport layer enmeshed network in low-Earth orbit. The network would be resilient and upgradeable, and derived from commercial systems wherever feasible. Additional capability layers would be fielded at a later date, to be positioned "anywhere between here and the moon," Kennedy said. "Anyone who is tasked to plan or fight a future war with a peer competitor will need unperishable data on demand at scale around the globe, because our adversaries are cutting into our decision timeline. And we don't have a choice, we have to respond," he said. Capitalizing on advances in artificial intelligence to maintain constant custody of critical military targets worldwide, essentially creating "the internet of military things;"
Extending situational awareness from the Earth up to lunar orbit while developing the means to efficiently and critically maneuver in that area "and to do whatever else it takes to dissuade adversaries from attempting to deny or degrade our space-based capabilities;"
The notional space architecture comes from the agency's recently completed 60-day study, which Undersecretary of Research and Engineering Mike Griffin directed DARPA and Kennedy to complete in a Dec. 6 memo, Space News first reported. 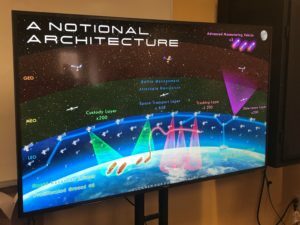 The Space Development Agency's notional space layer architecture as outlined by new director Fred Kennedy April 9, 2019. Kennedy said Tuesday that the numbers of systems listed for each layer in the architecture should be taken "with a serious grain of salt," but that the order of magnitude is about correct. The agency is anticipating hundreds, if not a thousand additional small satellites being launched to offer a variety of capabilities. The enmeshed sensor layer is the agency's number-one priority, as all other efforts are predicated on its resilient, low-latency, global indications capability, he added. The SDA's second priority is mitigating advanced missile threats, and the agency will work with the Missile Defense Agency, DARPA, the Air Force and other partners to field a tracking layer capable of providing worldwide detection, indication and tracking of adversary threats, Kennedy said. "Other layers will follow, on deployment timelines of two years and perhaps even less," he said. The SDA plans to take advantage of commercially developed technologies and systems, but as the commercial market can be unpredictable, "we are prepared to go work this problem independently if we have to," he said. The agency, along with DARPA and its Blackjack program, will work with companies building mass-produced space aircraft, ground command-and-control systems "in a box," commercial launch services and low-cost user terminals to build the new space architecture, Kennedy said. DARPA's Blackjack program plans to field 20 spacecraft by late 2021, and SDA plans to work closely with DARPA to apply lessons learned and transition critical technology and systems to the new architecture, he said. The goal of SDA's planned efforts is to emulate the smartphone industry's approach to upgrades, Kennedy noted. "We are not building exquisite systems intended to last a decade or more. To the extent possible, we'll be buying and building commodities which we can update and replace or upgrade on short order." Earlier at the conference, Air Force Secretary Heather Wilson appeared to take some shots at the SDA's plans during her final keynote speech at the Space Symposium as she plans to leave the Pentagon at the end of May. She said the idea of a "one size fits all" architecture with small satellites would be disastrous for national security, and added "launching hundreds of cheap satellites into theater as a substitute for the complex architectures where we provide key capabilities to the war fighter will result in failure on America's worst day if relied upon alone." That analysis came from the Air Force's own separate 90-day study that sought to examine the service's future space strategy, she said. Wilson has previously stated that she has "some concerns" about the mission of the Space Development Agency, and how it would serve a different purpose from current space-related organizations (Defense Daily, Feb. 28).